Mick Smyer is the former Provost and a current Professor of Psychology at Bucknell University. 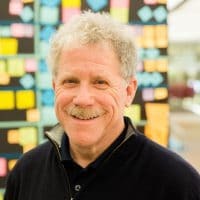 He is also a Senior Fellow in Social Innovation at Babson College and an honorary Professor in the School of Psychology at the University of Queensland, Australia. A national expert, Smyer has written and lectured extensively on aging. In addition to holding leadership roles in national organizations on aging, Mick has also consulted with Fortune 500 companies, state and national legislative leaders, and higher education organizations on the impacts of aging. Mick is the founder of Graying Green: Climate Action for an Aging World. Graying Green links two global patterns: population aging and climate change. Graying Green works with older adults, climate communicators, climate scientists, and community and business leaders to move older adults from anxiety to action on climate issues. In doing so, Graying Green views older people not solely as victims of climate change but also as potential leaders of climate action. With support from Stanford’s Hasso Plattner Institute of Design, Graying Green taps expertise in gerontology, climate communication, and human-centered design. Mick holds a bachelor’s degree in psychology from Yale University and a Ph.D. in clinical psychology from Duke University. A native of New Orleans, Mick also provides vocals and “nuanced” washboard with the Rustical Quality String Band, including on their most recent CD, Rescued from Oblivion.